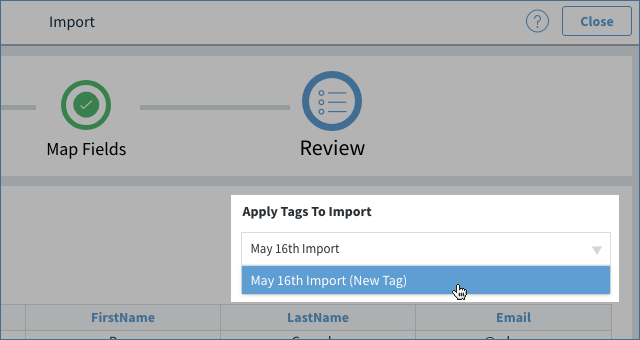 Most new users come to the import/export tool to import a list of their leads into their Method account, so our documentation will focus on how to import leads. 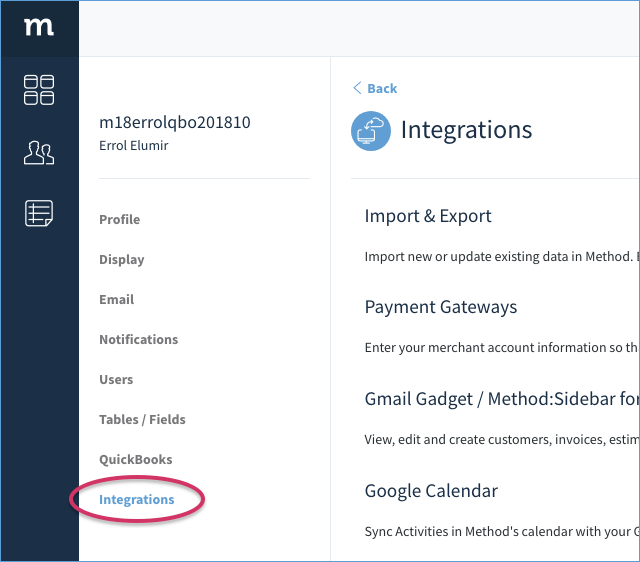 Your Customers in QuickBooks will automatically sync to Method, so rarely do people need to import them. However, if you are coming from another CRM and want to import, the process is identical, other than choosing Import Customers as opposed to Import Leads at the beginning. Before you begin, you may want to make sure you have the proper permissions. Please see our article Giving Access to the Import / Export Tool. Furthermore, your import file needs to be formatted properly in a spreadsheet. Spreadsheet templates are available. Please see our article on Import Templates. Unfortunately, you cannot use .xlsx files at this time. Once your import file is ready, proceed with the following steps to import leads. 4. The Import screen will come up and you will be taken to the first step: Choose Data. Make sure Import Leads is selected. 5. Drag your import file into the dashed outline box, or select click to browse to find it. 6. Once your file is uploaded, click the Next button at the bottom of the screen to continue. 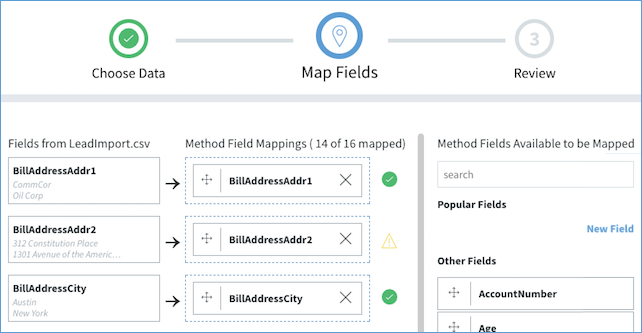 This second step has you to map fields: you will ensure the columns in your import file matches the fields of the table you are importing to. On the left are all the column headers in your import file. Green Checkmark - Field is mapped correctly. Blank - A field match was not automatically found, and must be manually mapped. If you are unsure to what the icons mean, hover over them and you will get a message indicating what the problem is. 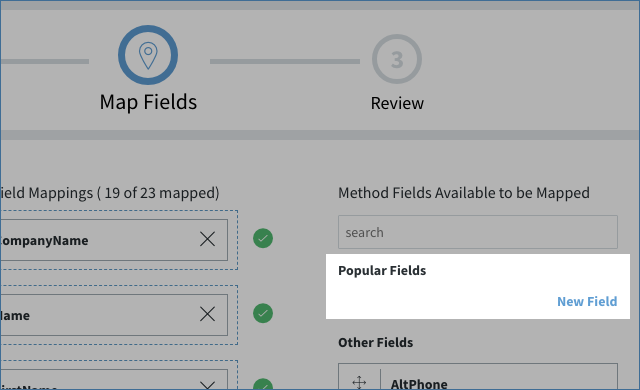 To manually map a field, delete the currently mapped field and then drag the field from the right hand side in. If there isn't a field in the table that matches a column in your import file, you can create a new custom field in the table. Click it, and you can create a brand new field within the Customer table. 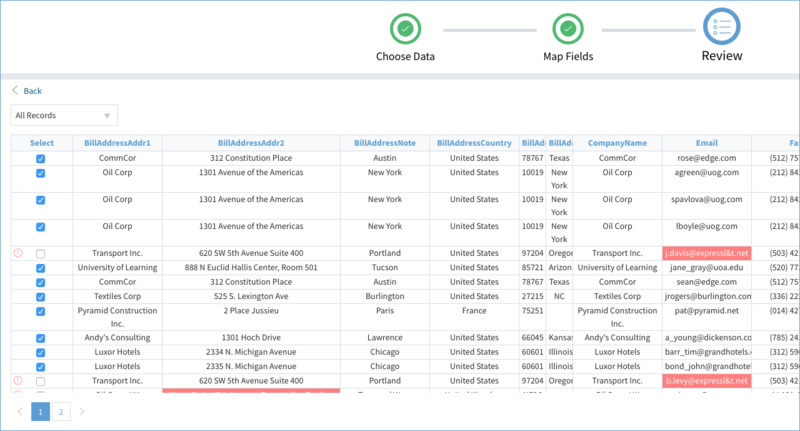 Once created, you can drag this new field to be mapped to a column in your import file. The final step allows you to review the data before it imports. Any conflicts will be highlighted and brought to your attention. At the top right of the grid, you can choose to tag each record that gets imported. The tags can be newly created or existing. Just type them in the field and they will be applied to all the imported records. In the below example, I am tagging the records with the date I imported them. This will allow me to find the imported records in case I made a mistake. Some records may have problems with them that would prevent them from being imported. You can review those records and make changes to the records before importing them. The view filter will let you filter the grid between All records and Records with Conflicts. In the above diagram, the rows where the Select column has been checked will be imported. However, note the rows which have a red exclamation mark and a red highlight. There are conflicts with these rows and they cannot be imported. Fix conflicts in the grid - By double-clicking the field, you can fix the error in the grid itself. This is useful if there aren't many conflicts. Export Records with Conflicts - If there are a number of errors you wish to look at or do not want to import, select this button and a csv file will be downloaded of ONLY the records with a conflict. You can edit this file for later import. Once you are satisfied with the reviewed records, click Start Import and your import will complete.